Information in this report relates to the World Health Organization’s ICD-11, currently under development. It does not apply to the existing ICD-10 or to the forthcoming US specific “clinical modification” of ICD-10, known as ICD-10-CM. When will ICD-11 be ready for dissemination? The revision of ICD-10 and development of the structure for ICD-11 began in 2007. ICD-11 was originally planned to be ready for dissemination by 2012, with the timelines for the revisions of ICD-10 and DSM-IV running more or less in parallel. Source: Archive documents, References  . Very early on in the revision process, the ICD-11 dissemination date was extended from 2012 to 2015. In 2009, launch of the Beta draft was timelined for May 2011, with the final draft scheduled for submission to World Health Assembly (WPA) for approval in 2014. In order to be ready for global implementation in 2015, the technical work on ICD-11 would need to be completed by 2012. Source: Dr Geoffrey Reed, Ph.D., May 2009, via personal correspondence. The decision was made to delay launching the Beta draft until May 2012. With the Alpha and Beta stages already running a year or more behind 2009 targets, it’s not clear how much time can be allocated for completing the Beta phase and two year field trials period – if the target for a final version for public viewing in 2014 is going to be reached. ICD-11 is a very ambitious project. The burden of drafting and liaison is being carried out largely via electronic means between individuals scattered across the globe and in addition to their clinical and academic responsibilities. Given the scale of the undertaking, its technical complexity, limited funding and human resources, lack of an overall project manager, reported communication problems between WHO, Revision Steering Group, Topic Advisory Group managing editors and members and the amount of work that remains to be completed, I cannot see this vision of WHO’s Bedirhan Üstün reaching fruition by 2016. For make-up of the Revision Steering Group (RSG) and the various Topic Advisory Groups (TAGs) see links at end of post. Membership of the various sub working groups to Topic Advisory Groups and the names of external peer reviewers of proposals and content have not been published by ICD-11 Revision. Where can the Beta drafting platform be viewed? The iCAT platform is more complex than the publicly viewable version of the Beta platform and has a mechanism for recording change histories which tracks additions, deletions and revisions to the draft as ICD chapters are reorganized and new content generated and populated. Population of content is managed by the Topic Advisory Group (TAG) Managing Editors following review by the Revision Steering Group. Structural changes to the classification, eg changing parent/child relationships and editing the linearizations can only be done by TAG Managing Editors in liaison with WHO classification experts. Source: Drafting Workflow text and chart [MS Word]; Swim Lane Workflow chart [PDF]. 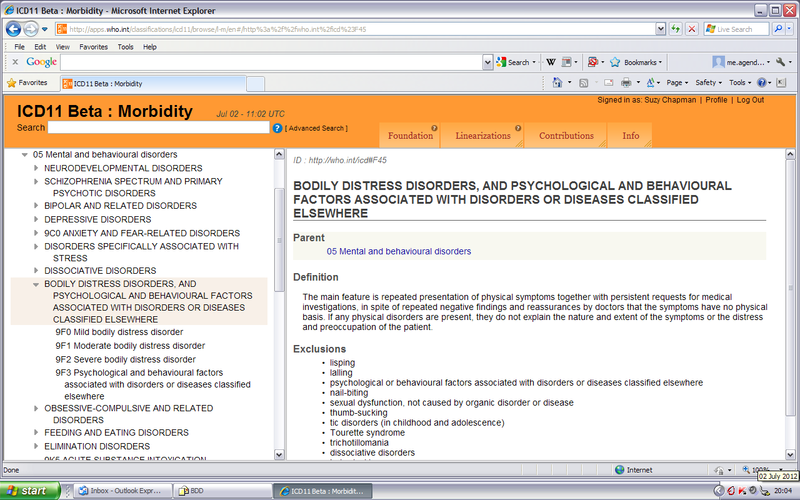 With no change histories displaying in the public version of the Beta it is difficult for stakeholders to track proposed hierarchical changes to existing categories, changes to the names of parent classes or child categories, proposed introduction of new category terms (and the rationales for these) or proposed retirement of ICD-10 categories. In the absence of rationales, it cannot be determined whether the disappearance of a category or group of categories is due to error or oversight by Advisory Group Managing Editors or others with editor level access, a temporary absence while a specific chapter section is being reorganized or whether these no longer displaying categories are intended to be subsumed under existing or new categories. For example, a number of ICD-10 F45 and F48 Somatoform Disorder categories were removed from the Beta draft in early July with no explanation of intention. Whilst ICD Revision invites interaction with the drafting process, the lack of clear intent on the part of Advisory Group editors and lack of response to requests for clarifications hinder submission of meaningful stakeholder comment and productive interaction with the process. When viewing the Beta draft, be mindful of the Caveats published by ICD Revision; the draft is in a state of flux. 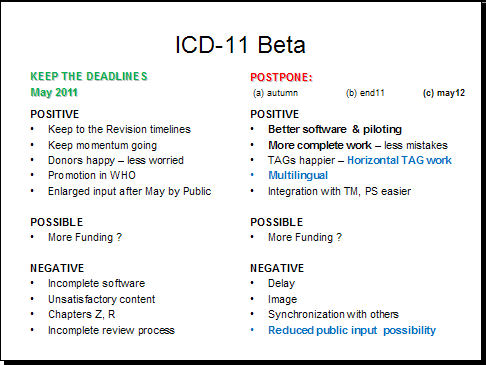 The ICD-11 Beta drafting process is a work in progress over the next two to three years. The Beta draft is updated on a daily basis to reflect the work being carried out on the iCAT platform. Parent terms, category terms and sorting codes assigned to categories are subject to change as chapter reorganization progresses. For definitions of Synonyms, Inclusions, Exclusions and ICD-11 terminology see the iCAT Glossary. Who are the stakeholders in ICD? Do you have a background in any of the following areas? WHO is asking experts from all over the world to sign up today to participate in the ICD revision. How can stakeholders participate in the Beta process? The public version of the Beta platform can be viewed without registration. Professional stakeholders and others who register an interest are able to interact with the drafting process and have access to additional content. Comments left by registered stakeholders are not visible to non registered viewers. Comments cannot be edited or deleted and appear immediately. In ICD-10, other than Chapter V Mental and behavioral disorders, there are no definitions or other descriptive content associated with ICD categories – just hierarchical lists of diseases arranged by chapter and their ICD codes. 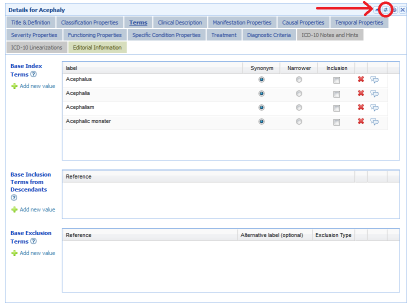 There are currently 13 defined parameters in the content model to describe a category in ICD. All categories will have an ICD Entity Title, Classification Properties, Textual Definition, Terms and up to 13 parameters described. Some ICD-11 chapters are more advanced than others for reorganization of categories and population of proposed definitions and text for other parameters. In setting itself the task of generating, peer reviewing, populating and approving this amount of detail across the entire ICD, one has to question how realistic a goal this is within current timeframes. It would not surprise me if at some point before the end of this year, ICD Revision Steering Group announces further delays for the Beta drafting and field trial stages and an extension to the projected dissemination date, or a scaling back of the project if completion of ICD-11 and its several, planned speciality publications, by 2016, is to be viable. Will ICD-11 be implemented worldwide from 2015/16? ICD-10 is used in over 100 countries, worldwide. Assuming ICD-11 does meet it schedules, it may still take several years before countries currently using ICD-10 are ready to adopt ICD-11. Several countries have been authorized by WHO to develop their own “Clinical Modification (CM)” of ICD. Canada uses an adaptation called ICD-10-CA, with a version published for 2009. Germany uses a version called ICD-10-GM. Australia (ICD-10-AM) and Thailand (ICD-10-TM) also use country specific modifications of ICD-10. The US lags behind the rest of the world and is still using a CM version of ICD based on the ICD-9, which is long since retired by the WHO. Instead of moving onto ICD-11, once this is completed, the US had scheduled implementation of a clinical modification of ICD-10 called ICD-10-CM, for October 1, 2013. 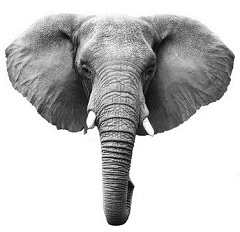 ICD-10-CM has been in development for a considerable number of years. On April 17, 2012 the Secretary of HHS issued a proposed rule to delay the compliance date for ICD-10-CM and ICD-10-PCS codes sets from October 1, 2013 to October 1, 2014, in order to allow more time for clinical practices and the coding industry to prepare for transitioning from ICD-9-CM to ICD-10-CM. The public comment period for the proposed rule to delay the compliance date is now closed and comments are in the process of being reviewed. A final rule has yet to be announced. Until a new compliance date has been ratified and the revised implementation date reached, codes in ICD-10-CM are not valid for any purpose or use but can be viewed for free on the CDC website together with other ICD-10-CM documentation. The US might not anticipate moving on to a clinical modification of ICD-11 before 2020 and possibly later*. WHO-FIC meeting materials suggest no earlier than 2018 for Canada. Australia is discussing earlier adoption of ICD-11 (or a CM of ICD-11). WHO acknowledges that there may be areas where congruency may not be achievable. With the timelines for DSM-5 and ICD-11 running out of synch (DSM-5 slated for publication in May 2013; ICD-11 still at the Beta drafting stage with a two year period scheduled for completion of its field trials), this may present barriers to harmonization. With the three systems: DSM-5 (publication date May 2013), ICD-10-CM (subject to partial code freeze since October 1, 2011 until 2014+ with new compliance date t.b.a.) and ICD-11 (dissemination scheduled for 2015+) set to become potentially more closely aligned, proposals for ICD-11 may have implications for US health care professionals and patient populations who might also consider themselves stakeholders in the ICD-11 development process. 4] Closing remarks, PowerPoint presentation: “Proposal for the ICD Beta Platform”, Stanford team, 12.04.11, WHO, Geneva.